Last week I posted a tutorial on commenting. Everyone loved it1. Somebody even emailed me to say that they would gift2 me with a new3 car4 if I ever used footnotes again. Sweet. Anyway, in the spirit of that post, today we have a tutorial on emailing posts. Let’s begin5. At the top of every post is a little tiny envelope. This envelope is more than just a pretty little picture. It’s a link. 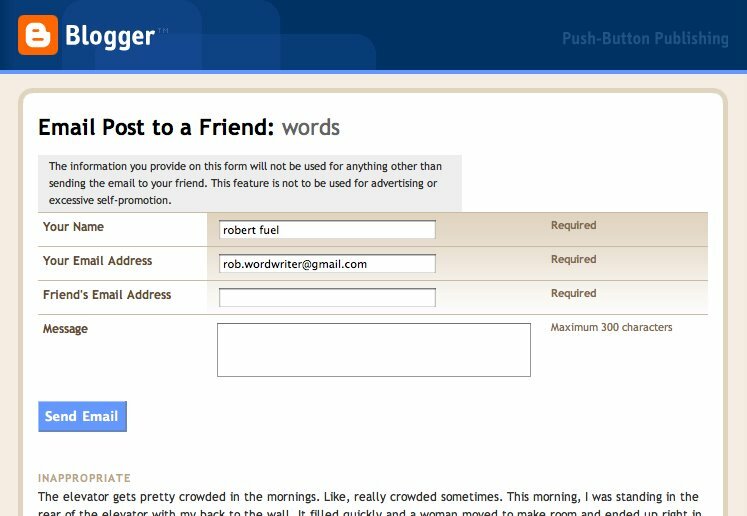 If you click it, it will take you to a page where you can email the post to a friend6. If you forget what the envelope is for, just read the text right to the left of it. That’s not just letters arranged in a random order. It’s a clue. • You read the post and immediately thought of your little brother, who has an inexplicable fascination with France and hepatitis. • You read the post and thought of your cousin Cora, who finds all defecation-related humor absolutely hilarious. • You read the post, felt objectified as a woman9 and insulted beyond comprehension. So you email the text to all your women10 friends to rally a torch-wielding, murderous mob to kill me in my sleep. • You read the post and thought of Bill in Accounting who, like the post, is also incredibly mediocre. You email him in an attempt to motivate him to greatness through my bad example. • You read the post. When you regain consciousness, you email it to all your enemies in the hopes that they too will suffer the agony that afflicted you. So if you like a post and think someone else might like it, take advantage of the easy-to-use email feature. Thanks11. 1 This is a lie. Most people hated it with a passion that burns stronger than this fire that's been burning in Pennsylvania since 1962. 5 If you got the guts. 6 Or enemy. Some posts are better suited for sending to your enemies for torture purposes. 7 When sending posts to your enemies for the purpose of torture, you might consider using an alias. 9 or toaster, kidney or attack monkey, as the case may be. 10 or toaster, kidney or attack monkey, as the case may be. 11 and please don't use words as torture or spam, please. I've got all the hate I can handle right now. Oh, I've got the guts. 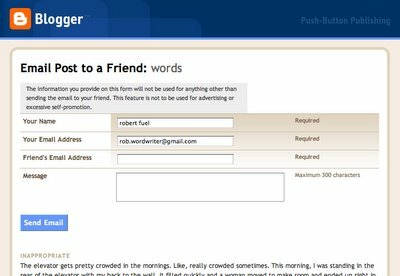 you need to let blogger know about this post and the other one about leaving comments. they're hilarious and useful - and someone on staff there (if you can get their attention) needs to know about your unique approach. it might seem like nothing to you, or even just a small joke - but the writing/creating's already done - so just go for it. give them the links. see what they say. All rights reserved. Reproduction prohibited without proper consent.